I was very pleased to see, at the bottom of my library ticket for Defending Country, Aboriginal and Torres Strait islander Military Service since 1945, that it’s “in demand” and that my “prompt return would be appreciated”. That means that there’s keen interest in this book, and I think that’s a good thing. As I said in my previous post about Our Vietnam Nurses the history of marginalised groups in the military has been overlooked for far too long, considering the plethora of books we have about war service. However, I suspect that some readers will be disappointed by this one, no matter how interested they may be in the subject. The book ranges across a number of themes, some of more interest to the general reader than others. The book focuses on service post WW2, but of necessity it has to cover the fact that Aborigines and Torres Strait Islanders were disbarred from enlisting in WW1 and WW2 unless they circumvented the contemptible provisions of the legislation. The first chapter refers to the way that many of them did enlist, served with distinction as men among equals and were then confronted by discrimination when the war was over. The chapter then explores Indigenous participation in the postwar Occupation of Japan, exposing the dichotomy between government intentions and what actually happened. Military selection boards excluded indigenous enlistment by enforcing the rules about European origin and descent but there were some Aboriginal soldiers still in the army from WW2 and there is documentary evidence that some of these went to Japan. It was interesting to note that official determination to prevent Aborigines from serving there was in part due to wanting to placate local racial sensitivities i.e. the racism of the Japanese. What these circumstances exposed was the inconsistency embedded in the rules. They were unworkable. In 1948 the restrictions on Indigenous enlistment in the army were removed from Australian Military Regulations and Orders 177 , though in practice it was still discouraged. (The air force and the navy were able to retain their discriminatory practices because the Defence Act of 1909 was still in force). The relaxation of these rules meant that a small number of Indigenous men were able to serve in the Malayan Emergency and the Korean War, including the most high profile indigenous serviceman Reg Saunders, who rose to the rank of Captain. Like many who had served with distinction in WW2, in the postwar period he had found it hard to settle into the sort of menial jobs that discrimination allowed, and he re-enlisted, not least because it was a way to be paid according to his abilities and to have a career. Throughout the book, this theme is prominent: military service offered Indigenous people work that was otherwise not available to them. It was satisfying work that offered opportunities to travel and to gain qualifications. The work was well-paid, and respected. And by and large, they were not subject to racism from the other men. 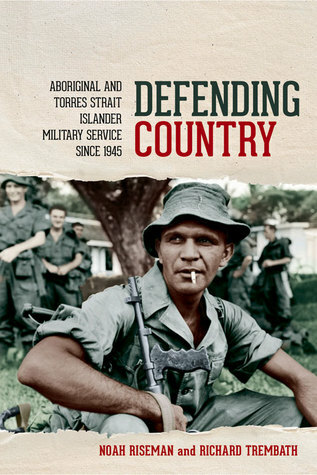 Aboriginal and Torres Strait Islander men and women who served in the 1950s-70s were less likely to perceive racism in the armed forces than those who served in the 1980s-90s. But peacekeeping operations in Somalia and East Timor led to different experiences although there were other factors at work as well, not least a movement away from assimilationist policies. The chapter about Indigenous women appears to have been limited by the very small number of women interviewed. The main thrust of the chapter is that army service enabled Indigenous women to learn skills that became useful to them in other fields of endeavour once they’d left the army. Learning a trade is a very common reason for enlistment in general, the main attraction being much better rates of pay and conditions than apprenticeships in civilian life. However, for some Indigenous women it was that the army offered a way out of being trapped in domestic service. Women in the forces until comparatively recently were confined to mainly clerical roles so they did not have the opportunity to learn trades like men could. But whether skilled or not, it’s much more difficult for Indigenous people – both men and women – to get employment after their service ends, especially if their homes are in remote areas. A sad irony is that the institutionalisation of the Stolen Generations made it easier for some of them to adapt to military life. Unlike children brought up in ordinary family life, they were used to sleeping in dormitories, eating and socialising in communal areas, not having any privacy, and being ordered about. Having long suffered the pronouncements of Bruce Ruxton who was the abrasive mouthpiece of the Victorian RSL, I was surprised to read the chapter about the RSL leading a campaign to have Indigenous servicemen granted the vote. The campaign was predicated on the racist belief that servicemen had proved their worth in war rather than on any fundamental notion of human rights, and it fizzled out in due course, but still, it goes a little way towards improving my attitude towards this influential conservative organisation that supported the White Australian Policy, long, long after it should have been dead and buried. If this book had been available when I was developing curriculum about Indigenous Service I would have found it useful as a reference, especially in noting Indigenous service in Japan, Korea, Somalia, East Timor, (about which my researches as a primary teacher had turned up nothing.) The book also places Indigenous service in contemporary surveillance operations along our northern coastline into a broad context including the Reconciliation movement. (Unfortunately although Indigenous people have served in Iraq and Afghanistan, they were not included in this book). But, surprisingly, given that there are plentiful quotations from people interviewed by the authors, it is disappointing is that the book rarely captures the voice of the people interviewed. I think this is because most of the quotations are short, and in the service of some line of argument, rather than telling coherent stories of the people concerned. Perhaps that’s a book for another day. There is a very brief review by Steven Carroll in the SMH and another scanty one at Boffins Books. I’ll keep an eye out for a more rigorous review by a professional historian and also one with an Indigenous perspective. It does sound very academic – PhD research turned into a book, perhaps, without thought as to editing it for a less specialised reader. That’s a pity, because the content does sound interesting & as you say, an under-represented part of our history. Thanks for your outline, at least I enjoyed reading that! Goodness knows why I bought it but I once had a book which was about turning history PhDs into reader-friendly books… I gave it away to someone who I hope is making good use of it. But I suspect that years of academic reading and writing leaves its mark, and not everyone can switch from one style to another. Still, I wouldn’t discourage adult readers from tackling this, it’s just not very suitable for inexperienced readers, which is a pity because I’d like this topic to be widely read. Yes, I imagine it would be difficult to switch styles if you normally only write as an academic. Agree with you about the topic being widely read. I did notice quite a bit of social media commentary about Indigenous service men & women this ANZAC Day, so I guess the info is gradually getting out there. That’s good:) yay for social media! Thanks for this, John. I see from the link that its sub-title is Life Stories of Aboriginal and Torres Strait Islander Servicemen and Women, so it sounds like just what I was looking for.